Your flavours – Salt, pepper, parsley, paprika. 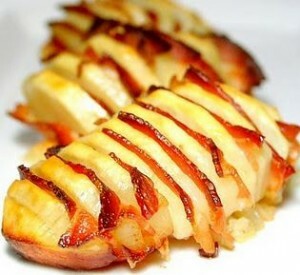 Take a potato and bake in over at 180 degrees for about half hour, depending on your oven. Once cooked, add cheese and wrap in bacon (I use toothpicks to keep it attached), add flavours – cook for 5 minutes – Voila!